Open House HC18A 18" Data Hub Wiring Enclosure Box Cover!!! The Model HC18A 18" Enclosure Cover fits on the Model H318 structured wiring enclosure. The ventilated enclosure cover secures and protects the structured wiring components mounted inside the Model H318 enclosure. The cover is power coat painted bright white. 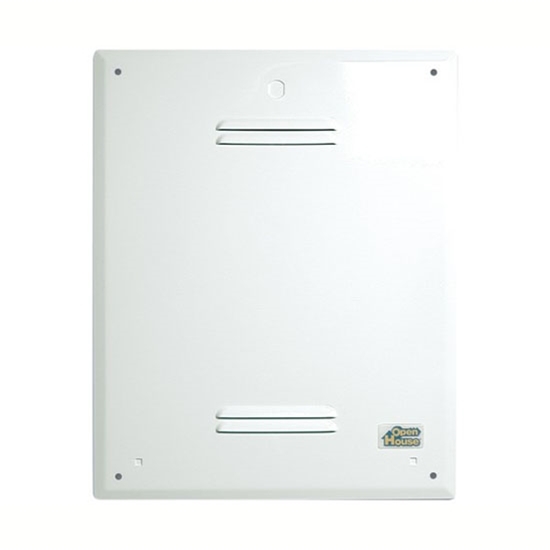 The optional Model H208 lock kit can be installed on the cover for additional security. Secures and protects components inside the enclosure. Bright white powder coat paint finish. Four louvered vents for enclosure cooling. Dimensions 19 1/2" x 15 1/2"